We are New Beginning Chapel Bournemouth ([login to view URL]), a branch of the Redeemed Christian Church of God (RCCG). 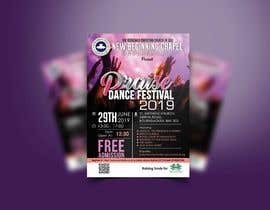 Hosted by us, Praise Dance Festival is an annual, energetic, hugely uplifting family event, that celebrates the love of Jesus through music and dance and is open to all. Choirs and gospel artist from far and near would entertain on the day. We also use the opportunity to raise funds for charity, this year, we are supporting The Waterlily Project; a Christian Charity ([login to view URL]). Also room need to be left for Eventbright registration address. Last years Flyer has been uploaded and the Church Logo. Thank you all very much for you input. I believe the committe have got a wide array of options to pick from. NO MORE ENTRIES PLEASE.